1. Login to https://docs.google.com/a/cgiar.org using your CGIAR.ORG account (e.g. t.jordan) and the password you manually created for this account. Note: Once you login, you will see the list of all the documents you have in this account, including those created by you or shared with you. For this exercise, we will only migrate the document created by you (since you are the owner). The other documents on the list are documents that have been shared with you by other owners, so the owners of those documents should be responsible of exporting and/or re-sharing those documents with your 'cgxchange.org' account. 4. Once you create the folder, click on the 'Owned by me' link on the left. This action will display all the documents you have created in the 'cgiar.org' Team Edition. 8.Login to http://docs.cgxchange.org with your usual CGIAR username and password. c. You will see that a new document with the name: 'copy of 'thenameofyourdoc' appears on screen. 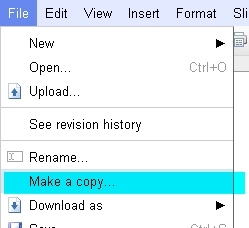 d. Rename the document by clicking on the document name. Save and close. e. Repeat steps a-d for each document in the folder you are migrating. 11. Once you have manually copied each document on cgxchange.org; refresh (F5) the home of the docs page, and you will now see the documents directly on your CGXchange account. 12. The advantage of this approach is that you are getting a copy of the latest 'editable' version of the document on cgxchange.org, including the security settings you had already set on cgiar.org. Note however that the revision history of the documents you had in 'cgiar.org' will be lost and the link of your new document is different from the one you had in 'cgiar.org, thus you should make sure you notify your users of the new link. Important Note: please make sure that no more changes are done to the documents that you have exported on the 'cgiar.org' Google Docs. Make sure you continue editing the documents directly on CGXCHANGE.ORG and inform your collaborators about this. 13. How to notify collaborators of the new document link? c. Once the correct Google accounts are identified, use the Share > Email editors/viewers to write an email to the collaborators so they are aware of the new document link. TIP: if the collaborators are usually the same people, it is recommended you create a new folder (collection) on CGXchange; move the documents to the folder and set the folder security once for all the documents so you won't have to set the security on each document one by one.